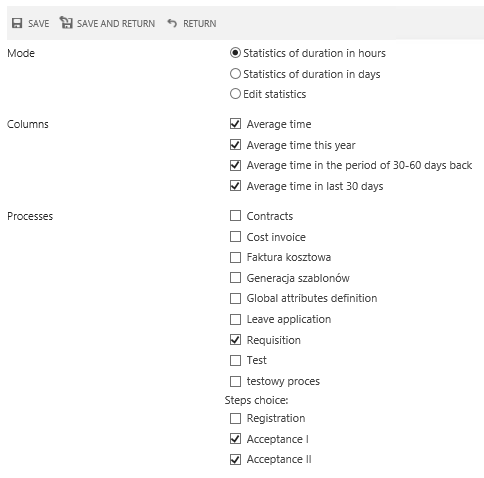 WebPart KPI gives access to statistics of document duration time for particular steps (except ending steps) and mean time of edition at particular steps. Statistics may be browsed considering all users assigned to document at given step. 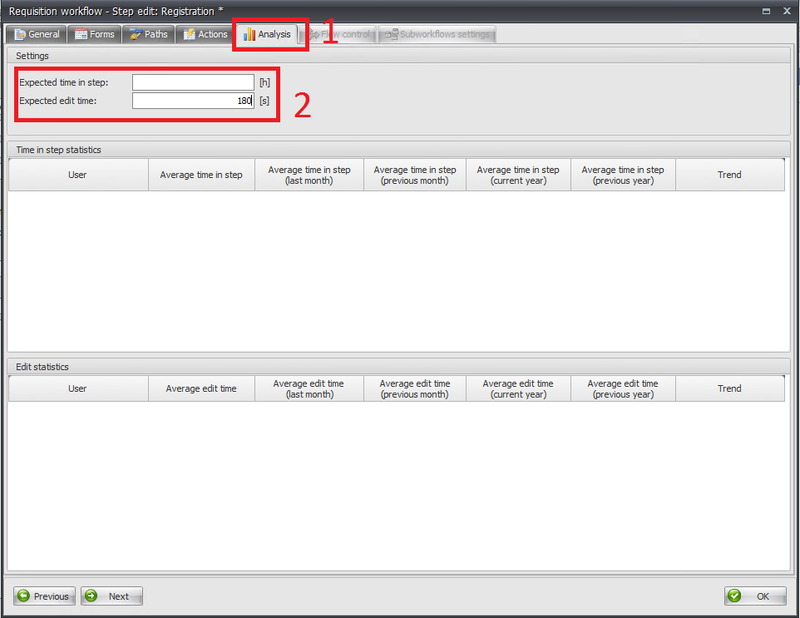 Is is possible to configure planned edition and duration time for a step. Thanks to such knowledge, it is possible to check which department holds document for too long, or for which steps, edition time is too long and it is necessary to simplify the form. Except mean edition/duration time, WebPart allows to analyze this data in context of current year, last month and compare trend from last two months (shorter/close/longer mean time). 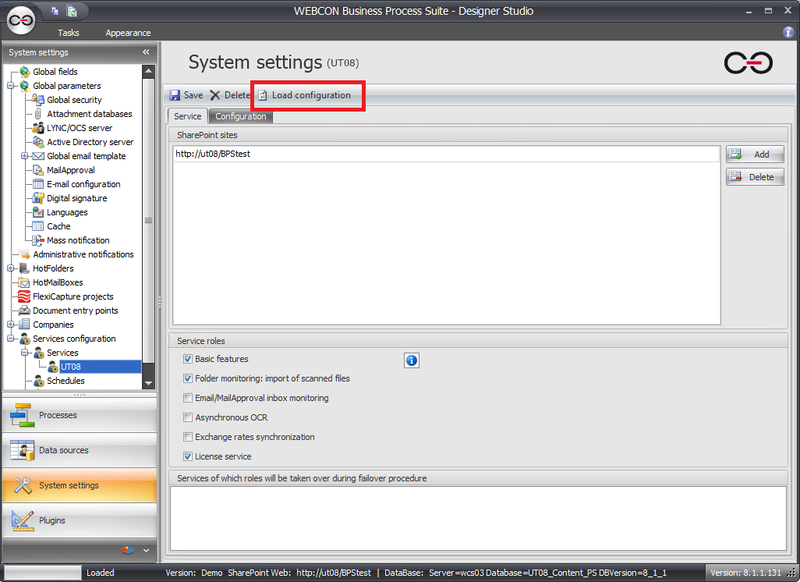 Before we will start configuring WebPart itself, configuration in Studio is necessary. Analyses are generated by BPS Service, so it is necessary to make sure that it is running properly and Basic features are turned on. In system settings tab, open service configuration menu and choose your service. Data actualization occurs only in hours configured by user. In order to set these hours, go to schedules tab. In section “KPI analysis refresh configuration” set hours in which statistics will be refreshed. As server may be heavily loaded, it is recommended to set these hours after work hours. After choosing proper settings save your work. After saving your settings it is necessary to reload service. Go back to configuration of your service and click “Load configuration” button on top. Exemplary process will consist of 1 start step, 2 middle steps and 2 ending steps. It is going to be a process in which employees submit request to their superiors (Acceptation 1 step) and if they are accepted, request goes to the boss (Acceptation 2 step). Ending steps have no importance for WebPart. It is important that edition of the form is available only on the first step (Registration). Acceptation steps allow only two options to accept or reject the request. Next step is to place two KPI WebPart’s on webpage. First one will show statistics according to edition time in step of Registration. After adding webpart, go to its configuration, change working mode to “Edit statistics”, choose columns, process and registration step. As in our workflow, possibility to edit is available only on registration step, it is not necessary to display such data for remaining steps. If both acceptation steps were chosen, system would display time in which the document is open in edit mode. Such calculations have no sense if superior cannot change any values of form fields. It is possible to display data from number of processes in one webpart, but then it is not possible to limit for which steps, we want to display statistics. It is worth to remember that if no steps were chosen, all steps from a process would be displayed. Values for columns “Estimated edit time (seconds)” and “Estimated duration time (hours)” has to be defined by ourselves for every step. 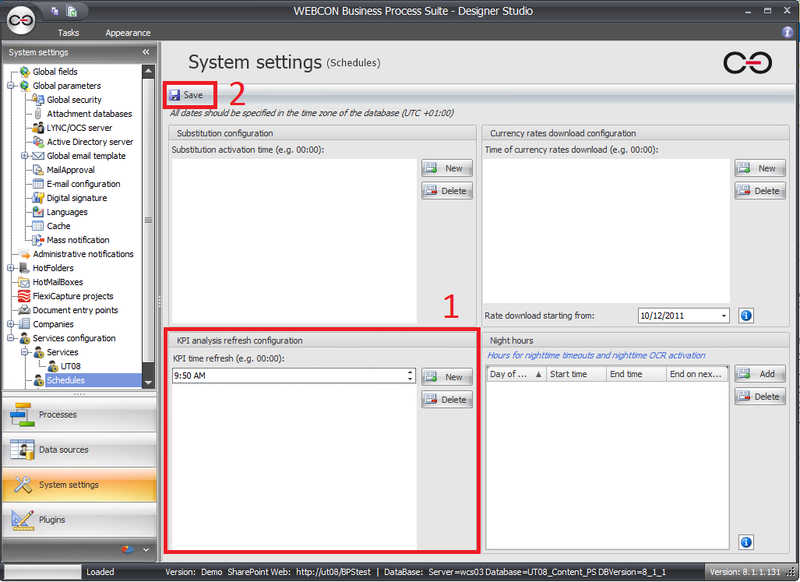 In BPS Studio look for your process, go to workflow and choose configuration of first step. Choose “Analysis” tab and fill both fields in Settings section. It is also possibile to browse statistics in this tab. Except analysis for every step, as seen on screenshot above, it is possible to see statistics for users who participated in given workflow by clicking + next to title of the step. In columns with duration/edit time, icons may be seen. They role is graphic description of time relatively to planned time. In Trend columns we may see arrows showing difference of current time and time from previous month. – Time needed for first acceptance of request slightly increased, but it is caused by new employee who needs some time to familiarize with the system. – Time needed for second acceptance decreased a lot. Despite the fact that mean time from whole period is still much longer than planned 48h, we may see that for last 60 days, it is much below 2 days and for last 30 days, it is even below 30 hours. If such trend will continue and stabilize, it is safe to assume that soon it will be less than planned 48 hours. 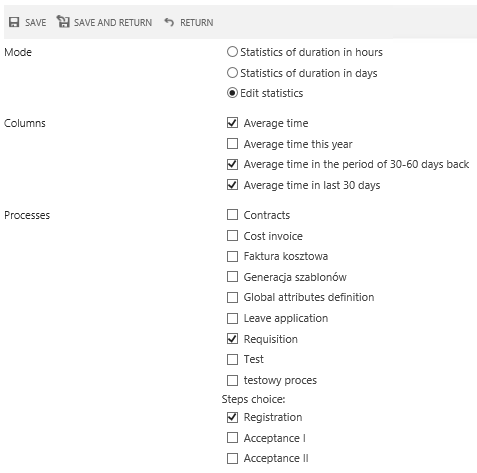 It is worth to add, that for processes in which, documents may wait for couple of days in certain steps, it is possible to configure webpart so it shows number of days not hours. As these values have maximum of 1 point after comma, using them in processes where waiting time is short, may cause some mispresentations.